The first shot tower in Collingwood was built in Sackville Street in 1878 for Louis Hamel. This shot tower in Reilly Street (now called Alexandra Parade) and its associated factory was built for Richard Hodgson in 1882 to manufacture lead shot. The tower is all that remains today and is probably the tallest shot tower in Australia. The total height of the edifice is 80.1 metres comprising a cylindrical brick structure 76.5 metres in height topped by a narrow 3.6 metre chimney. It is circular in plan, looking like a tall chimney, and is a masterpiece of brick construction with finely decorated polychrome patterned brick bands at regular intervals. The semi-circular arched windows are also decorated with polychrome bricks. It is a fine example of a rare and distinctive building type – the only other remaining shot tower is to be found in the Melbourne Central shopping complex. 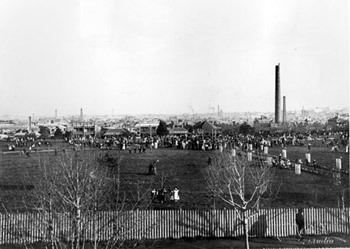 The Alexandra Parade Shot Tower is of State significance and represents an era of industrial growth in the 19th century in Collingwood and the inner suburbs. 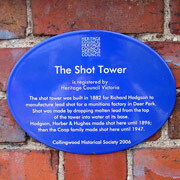 Richard Hodgson owned and operated the Lead Shot Works until 1887 after which it was owned by Alfred Harber and Simon Hughes. In 1896 it was purchased by Walter Coop, who also operated the Melbourne Central shot tower. It belonged to the Coop family for 90 years and remained in use until 1947. Hamel’s Sackville Street shot tower was put out of business and was demolished for its bricks. Lead shot was made by melting the lead at the top of the tower and then pouring it through a perforated sheet which separated the flow of molten lead into streams. It was then broken up to form droplets. The droplets were shaped and solidified as they fell from the top of the tower, and were cooled by dropping into a trough of water at the bottom of the tower. The shot was then shovelled out of the water trough, dried and rolled down a stepped, inclined table. Undamaged shot cleared the step while damaged shot dropped through a gap at the bottom of the step and was remelted. The round shot was sieved to size and then polished in a rotating barrel for one and a half hours before being sewn into 13 kilogram hessian bags and taken to the munitions factory at Deer Park, in the west of Melbourne. The Shot Tower is a landmark of Clifton Hill and was used by pilots flying into Essendon Airport as a visual marker to their location. Australian Die Casting Association: Article in “Die Casting Bulletin”. Barrett, A.H.B, 1970, The making of an industrial environment: Collingwood 1851-91, M.A. thesis University of Melbourne. Barrett, A.H.B, 1971, The inner suburbs: the evolution of an industrial era. Melbourne University Press. Hibbins, G.M, 1997, A Short History of Collingwood. Collingwood Historical Society.